I first came up with this side dish in the middle of March and I don't know what has taken me so long to post about it, because it was an immediate family favorite. The first time I made it, I just needed something to go with some leftover grilled pork tenderloin. Unlike a true stir fry, I didn't use cold cooked rice because honestly, I was in a hurry and didn't want to wait for it to cool down. I liked the result because it makes a quicker prep time and the rice doesn't clump together. 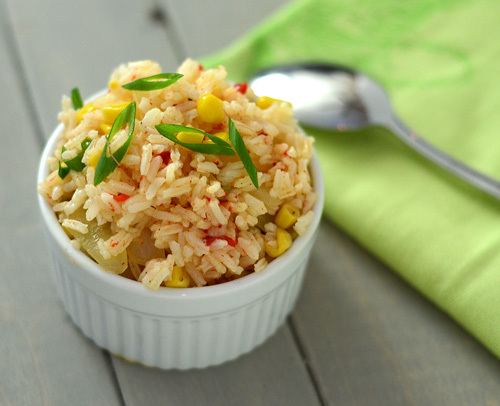 I started off calling it Creole stir fried rice but because it uses Tony Chachere's creole seasoning, it has gotten dubbed - Tony Chache-rice. In a wok or large deep curved pan, cook garlic in oil for 30 seconds. Remove garlic and reserve. Add the sweet onion and the white base of the green onion, and stir fry 2-3 minutes, season with salt and pepper. Add corn and butter, stir to melt. Kill the heat, add green onion, red pepper, reserved garlic minced, creole seasoning, rice. Stir through, cover and rest 5 min. The Biolite Camp Stove might be the hippest new portable grills that I have seen. There are a lot of cool portable grill designs out there but the Biolite has an unfair advantage - it has a USB device charger built in that is powered by your fire! Obviously this is designed for camping and hiking but how perfect would that be now that football tailgating season is here? You can power mp3 players, portable speakers, or get a good charge on your phone before heading into the stadium. This isn't a review. 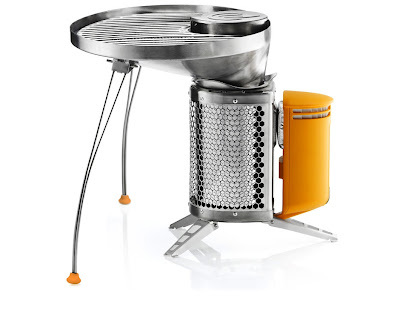 I haven't tried or even seen the Biolite in person so I can't attest to it's grilling prowess. It's obviously going to be a small grilling surface and I don't know how well it cooks using just sticks. I'm not even sure how long it will go on one load of sticks. I just thought it that concept was cool and would pass it on. Have any of you used one or seen them in use? [Standard Disclosure] I received no compensation from the suppliers mentioned in this post.